Anti-apartheid fighter Walter Sisulu, a veteran of the struggle against white rule in South Africa and long-time friend of Nelson Mandela, has died aged 90. Mr Sisulu died at about 2100 local time (1900 GMT) in his Johannesburg home after a long period of ill health, Mr Mandela's office said. "His absence has carved a void. A part of me is gone," Mr Mandela was quoted as saying by the South African Press Association (Sapa) news agency. Born in 1912, the same year that the African National Congress (ANC) was founded, Mr Sisulu rose to become the deputy president of the organisation. He also played a key role in Umkhonto we Sizwe, the armed wing of the ANC, as well as in forming the ANC Youth League in 1944. Sisulu was sentenced to life alongside the future president at the Rivonia Trial in 1964. 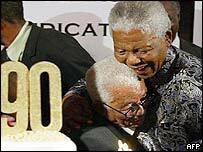 He spent 26 years at the notorious Robben Island prison off Cape Town and was released only in 1989 when he was 77. "(Sisulu) stands head and shoulders above all of us in South Africa," Mr Mandela has recently told a group of South African children. "You will ask what is reason for his elevated status among us. Very simple, it is humility. It is simplicity. Because he pushed all of us forward and remained quietly in the background." 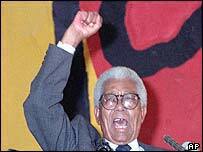 Mr Sisulu was married to Albertina Sisulu, who survives him. The BBC's Hillary Andersson in Johannesburg says Mr Sisulu will be sorely missed in South Africa and remembered as one of the most prominent figures in bringing the country to a new democratic era.